Success pinging EDF IAM and receiving response. EDF IAM transmissions when manual override is turned on and off. No appliance plugged into the EDF IAM. Who makes the EDF IAM? Each EDF IAM can both send and receive (the CC IAMs can only send). Each EDF IAM will only report its wattage when polled by the EDF EcoManager base station. This is great for my application because I should be able to completely avoid RF collisions. I’ve made good progress today. I think I can now reliably talk to my EDF IAM and get replies. Interestingly, the EDF kit appears to use almost exactly the same RF configuration as the CC kit; but with a slightly different packet structure. The EDF IAMs use a base frequency of 433.97MHz (compared with 433.90MHz for the CC kit) and a bitrate of 3.918 kbps. 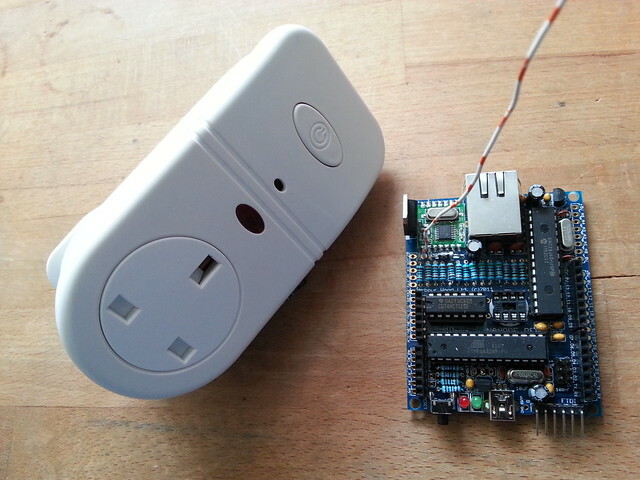 The RFM01 I set up to receive CC packets can recieve the EDF IAM packets easily. As far as I can tell, the EDF IAM packets are not “manchesterised” like the CC IAM packets; and the EDF RF packets are only 12 bytes long compared with 16 bytes of manchesterised data for the CC packets. The EDF IAM probably emits only a 12 byte packet. But I captured and displayed 16 bytes just in case the packet is longer than 12 bytes. The packets below were received using an RFM01 and my RFM01 Current Cost code (using exactly the same settings as for the Current Cost IAMs) running on a Nanode. Bytes 0 to 7 never change. Supposedly some of these bytes must be the ID. I only have a single EDF IAM so I can’t yet figure out which bytes are the ID. I plan to order some more EDF IAMs and an EcoManager tomorrow (I buy this EDF kit directly from EDF). Bytes 8 and 9 appear to be involved in communicating the measured watts value. I think byte 9 is the most significant byte whilst byte 8 is the least significant byte. Byte 10 is always 0x53 when the EDF IAM turns on and 0x4F when it turns off. Byte 11 appears to be an 8-bit checksum using the modular sum algorithm against bytes 0 to 10. Bytes 13-15 appear to be just noise, strongly supporting the hypothesis that the EDF IAM packet is only 12 bytes long. It’s also interesting that the EDF IAM doesn’t change its “on” or “off” packet after being “tuned”. This is in contrast to the CC IAMs which do change their packets after being tuned. Perhaps the EDF IAMs require a command from the EcoManager to tell the EDF IAMs which ID to adopt (this would be sensible as only the EcoManager base knows which IDs are current in use and which are available). I’ve started work on an DIY EDF EcoManager. My AVR C++ code is on github. I’m using an RFM12b 433MHz and a Nanode. At the time of writing, the code can ping my single EDF IAM, checks the incomming packet’s checksum and extracts the wattage. All very simple and the code is rather ugly at the moment because I’m still hacking around a lot. I had hoped that I’d be able to sample each appliance once every, say, three seconds. It looks like it is possible to ping the EDF IAM as rapidly as you want but it appears that the EDF IAM only bothers to take a sample once every six seconds or so. In other words, it appears to not sample the wattage when you ping the EDF IAM but instead it’s independently measuring the wattage and storing this value ready for transmission when you poll for it. 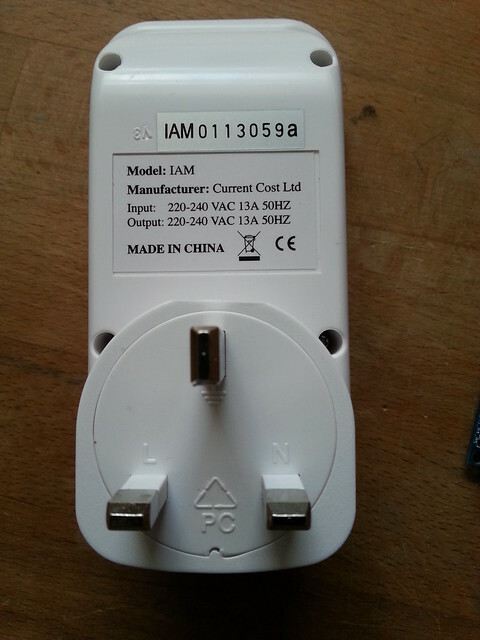 Note that this EDF IAM has a model name “IAM” whilst the CC IAMs have the model name “IAM Transmitter Only”. I’ve started a wiki page for technical details of the EDF EcoManager protocol. Please feel free to edit!